constantly bedeviled by a very loud woodpecker. As annoying as the bird was, however, they also found him kind of amusing — until it rained, and they discovered he'd pecked holes in their roof. 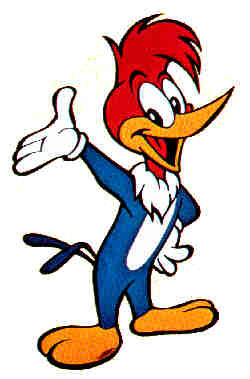 Drawing inspiration from adversity, Lantz decided to turn the woodpecker into a cartoon character. The only thing wrong with this story is that when the honeymoon took place, Woody had already been a cartoon star for a year. The Woodpecker's first appearance was as a supporting character in an Andy Panda cartoon, Knock Knock (1940). The script was written by Ben "Bugs" Hardaway, who, at Warner Bros., had co-directed the first cartoon featuring the embryonic Bugs Bunny; and in fact, Woody owes much of his personality to Bugs. His unique laugh, created by voice actor Mel Blanc (and later adopted by Blanc's successors in the role, including Hardaway himself and Lantz's wife, Grace Stafford), provided an easily recognizable trademark, and was enough to ensure the character's return. The Cracked Nut, a 1941 Lantz Studio production, kicked off Woody's own series — and, incidentally, was the film in which he received his name. (Like Droopy, Chip'n'Dale and many other cartoon stars, Woody was not named until his second outing.) That series included two Oscar nominees for Best Cartoon — The Dizzy Acrobat (1943) and Musical Moments from Chopin (1947, where he shared billing with Andy Panda) — and one nomination for Best Song, the one he sang in Wet Blanket Policy (1948). There were virtually no highlights from the late 1940s on; and yet, the series continued far beyond the heyday of Hollywood cartoons. The last one was Bye Bye Blackboard (1972) — a total of approximately 200 cartoons. Like most cartoon characters of the time, Woody also appeared in comic books. In 1942, he started making a few guest appearances with Andy Panda or Oswald the Rabbit in Dell's New Funnies, an anthology title that featured the Lantz characters. Within a couple of years, he was its star. In 1947 Dell started devoting a few issues of Four Color Comics to Woody. By 1952 he was in his own regularly-published comic, which continued until 1984. In the early 1990s, a few of the Dell issues were reprinted by Harvey Comics. Woody also briefly, in the early 1950s, starred in a newspaper comic from Consolidated News Features (Bobby Sox). Except for a single 1946 story drawn by Walt Kelly, creator of Pogo, not one of the hundreds of American comics featuring Woody was notable for outstanding quality. A few stories written and drawn by Freddie Milton have had very favorable reviews, but those were published only in Europe. It was, however, in the comic books that a couple of supporting characters were introduced. In New Funnies #182 (April, 1952), Woody rescued a pair of woodpecker boys named Nuthead and Splinter from a tiger, and they turned out to be his nephews. Four issues later, Nuthead's name was changed to Knothead. Nephew Splinter soon metamorphosed into a niece. As such, Knothead and Splinter later turned up in the cartoons. Woody's first TV show started October 3, 1957 on NBC. Walter Lantz himself acted as its host, and used the position to show the young viewers how animation was made. Woody's trademark laugh is still heard from time to time in the more obscure kidvid slots. He also made an appearance in Disney's 1988 Who Framed Roger Rabbit. And in 1999, Fox Kids Network debuted a series of new Woody Woodpecker cartoons (with Chilly Willy and Space Mouse in the back segments) on their Saturday morning lineup. So there's life in that old laugh yet. Text ©1999-2010 Donald D. Markstein. Art © Walter Lantz Studio.